The humpback whale, Spinnaker, was born to Palette in 2004 and was a granddaughter to Compass. Cataloged by the CCS Humpback Whale Studies Program, her name is based upon the sail-shaped marking on the lower left side of her flukes. She was found dead on the shore of Acadia National Park, Maine, in 2015. She was well-known to naturalists and scientists alike, spending her first summer with her mother off Massachusetts. Later she came to prefer more northerly areas of the Gulf of Maine (the body of water stretching between the Bay of Fundy in Canada and Cape Cod and Georges Bank to the south and east), such as the coast of Maine and the Bay of Fundy. During her life she was known to have been entangled at least four times. Her second-known entanglement was lethal; something we now know due to the preservation of her skeleton. Her story highlights the strength of collaborative research and response efforts and is a remarkably detailed example of the life of whales in the modern world. She will be on public display and available for ongoing research. 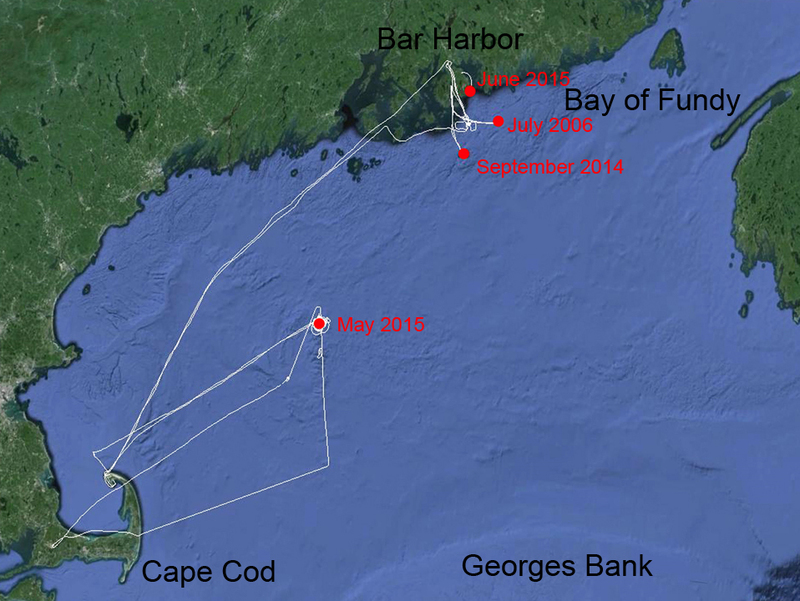 Between 2006 and 2015, Spinnaker was documented entangled in four distinct sets of fishing gear, including two separate sets in 2014. Based on research conducted by the CCS Humpback Whale Studies Program, this frequency of gear interactions is not unusual for humpback whales in the Gulf of Maine. The CCS Marine Animal Entanglement Response (MAER) team and collaborators disentangled her using the best techniques available. Despite this effort the team was unable to resolve a small portion of one of her entanglements from 2014. Standing below her skull and looking up, that portion of her entanglement is plainly visible. 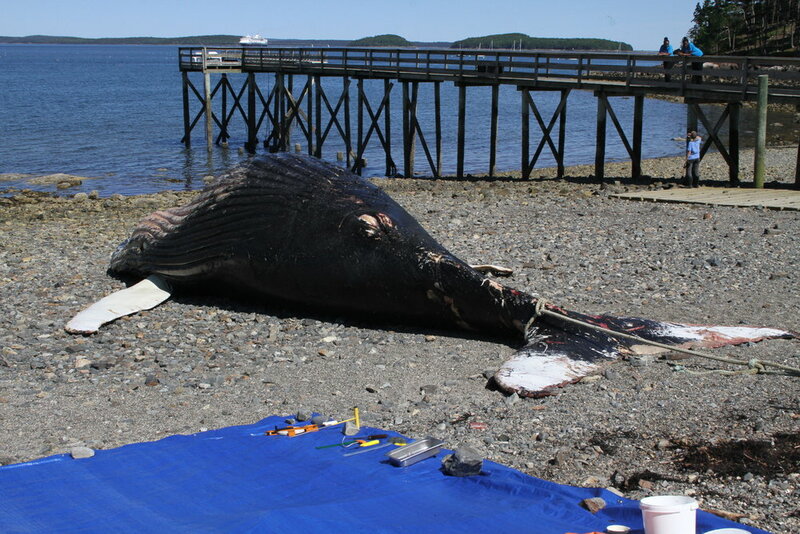 Spinnaker will continue to inform how we disentangle whales and her case highlights the need to find viable solutions to the entanglement problem. In September of 2015 the body of Spinnaker washed ashore in Acadia National Park in Maine. Over the subsequent days a detailed examination of body was conducted and samples were taken. While chronic entanglement is suspected in the cause of her death, further analyses are ongoing. During the preparation of her skeleton the bones of her left zygomatic arch (the bones making up the lower portion of the orbit of her eye) were found to be abnormal and pitted. Those bones have been preserved for further testing of possible infection and models were made to replace those in her display. The process of preserving and articulating Spinnaker took two years of work and preparation. During five days in May of 2017 her 1,300 pound skeleton was raised in the Ruth Hiebert Marine Laboratory for ongoing research and display. Map of entanglements and stranding of Spinnaker within the Gulf of Maine. Tracks of responses (by boat and plane) in white. All imagery courtesy Center for Coastal Studies, unless noted otherwise. Imagery of the humpback whale, Spinnaker, was collected under NOAA research and response permits 633-1778, 932-1489 and 932-1905 and accession number COA150611Mn.